Will you play citizens into your hometown for points, or contribute them to the capital and benefit from their special abilities? 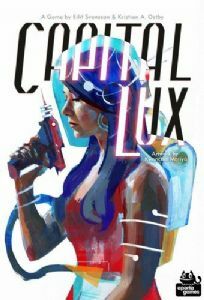 In Capital Lux, you always balance on a razor's edge, so will you take risks? Bluff? Or follow a carefully laid plan? The choice is yours in this clever card game, featuring beautiful art by American painter Kwanchai Moriya. Merchant: Take 1 gold coin. Gold coins can be used at the end of a round to increase your own limit for one of the four professions. Agent: Draw a secret modifier card and add it (face down) to one of the four professions in the capital. This will affect the limit of the chosen profession at round's end. Scholar: Draw a card from the deck into your hand. At the end of a round, for each profession, you are not allowed to have a higher total value in your hometown than the current total value in the capital. If you break the limit for one of the professions, you lose all cards of that profession from your hometown. At the end of the third round, all characters remaining in a player's hometown are worth points.